Your guiding style is an excellent match to my learning style. Your keen observations of my fly fishing skills, the gaps in my knowledge, my understanding of strategies, and your clear, thoughtful comments have helped me over the years increase my skills on any type of water, with any species of fish, anytime, anywhere. Your focus and enthusiasm for increasing the level of my knowledge and skill have made for a fishing experience that I’ve come to know from you - and you surpass my expectations every time! It’s been well over 12 years since I first participated in your fly fishing school on the Willow River in Wisconsin. One look at the river and with the first practice cast I knew this would be a sport that I would begin immediately and continue for a life time. Thank you for introducing me to this most elegant sport. 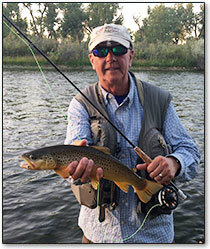 John Edstrom, owner of Headwaters Fly Fishing Company has been in the guiding business since 1987.He was employed as a guide by a Fly Fishing only Lodge - Bristol Bay Lodge near Dillingham, Alaska from 1987-1989- 3 seasons. John returned to Minnesota each fall and found a niche for guiding in Minnesota and Wisconsin as well. Since then he has been guiding fly fishers on the Upper Mississippi and St.Croix rivers for Smallmouth Bass, Western Lake Superior Rivers for Steelhead and on the Driftless Area trout streams. 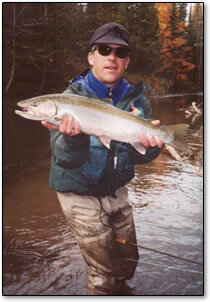 He also presents several seminars each year on fly fishing for Smallmouth bass and fly fishing for Steelhead. John has fished for steelhead all over the continent including Alaska, British Columbia, Washington, Oregon, California and Idaho, Michigan, Wisconsin and Minnesota. John and his wife Julie have two daughters (Kendall and Megan) and an English Setter that loves to find ruffed grouse. They feel fortunate to live in a region that has almost unlimited fishing opportunities. Bob is an accomplished rock climber and cross country skier who brings travel, adventure and athleticism to his fly fishing endeavors. Bob works part-time as an emergency room R.N., which allows him plenty of time to both fish and guide the local waters. Such employment also provides the creative nucleus for a decidedly unique world view. Bob has been working in the fly fishing industry since 1997 and formed Great Northern Adventures Guided Fly Fishing in 2000. John's been fishing the Western WI, SE MN, and MN North Shore for over 50 years. Has fished from the High Arctic to Belize and Atlantic Salmon to the famed Bristol Bay area in Alaska. John ran the Burger Bros. fly fishing schools for 25 years, and introduced many people to the fly rod. He always says "Sometimes the fly rod can be the most effective method for catching fish, but it is always the most fun". Born and raised in the Midwest, John loves the seasons of fly fishing, whether it's winter Trout, Ice out Panfish, Summer Smallies, night time Walleyes, MT trout waters, and of course fishing the hatches on the local Trout waters. John and his Brother developed the first emerging mayfly pattern on Armstrong Spring Creek, MT. the Goplin's Loop Wing Emerger, back in the 70's. And still loves changing patterns at the tying bench to see what's more effective.